There is a very broad definition for “home.” It can simply mean where you live. Or where your family resides. Where you’re from. In the end, one is usually very accustomed to the lifestyle, wherever that “home” may be. It’s definitely not the easiest thing to develop a routine in a brand new environment. The surroundings are unfamiliar. People are unrecognizable. The buildings are foreign. You simply don’t know where to go or what to do just for the sake of not knowing. Living somewhere new takes time to get used to. However, everything finally seems to be coming together. I’m starting to attain a better understanding of the Dunedin environment day by day. I can navigate myself around campus and town with ease. Time management has become simpler to handle. I’ve finally solidified and mastered my class schedule (no Fridays, which will make it much easier for traveling purposes). Faces are becoming more familiar. Friendships are continuing to grow and expand. In addition to that, my flatmates and I have become closer and closer, for the dynamic of the flat has turned out to be fairly strong. There is a lot of support that is shared between all of us. We keep each other company, even if we are just sitting in the lounge in silence. The silence is anything but uncomfortable, for it is understood that we are all at ease around each other regardless if there are words exchanged or not. Likewise, we will cook and eat dinner together occasionally throughout the week, keeping the direct interactions between us alive. Even on the weekends, we spend much of our time together keeping each other entertained and happy. Our schedules do not coincide very well throughout the weekdays, for they’re all very different. Yet, when we come back and find each other in the end, not much distance has been generated between us. Here in Dunedin, I have found that I am actually living. Instead of going to the on campus dining hall, I have to go to the grocery store, buy my own food and do my own cooking. Different responsibilities are shared between everyone in the flat in order to keep our living conditions in good shape. There are bills that have to be taken care of. I have to be aware about the amount of internet and power that I utilize. I even constructed a budget plan so that I can organize my money and keep my spending under control. As difficult and strange this was to me at first, I have become very comfortable with this type of lifestyle. Being conscious of almost everything I do and plan to do has only helped me build character. It not only prepares me for the semester I return to Richmond (I’ll be living in an off campus apartment spring semester), but it prepares me for the real world as well (as scary as that is to think about). Independence has been taken to a new level. This past Saturday, I had the opportunity to explore even more of Dunedin. My entire flat complex and I ventured out to the Otago Peninsula, where beauty and landscapes were intensified. We specifically went to an area called Lover’s Leap. 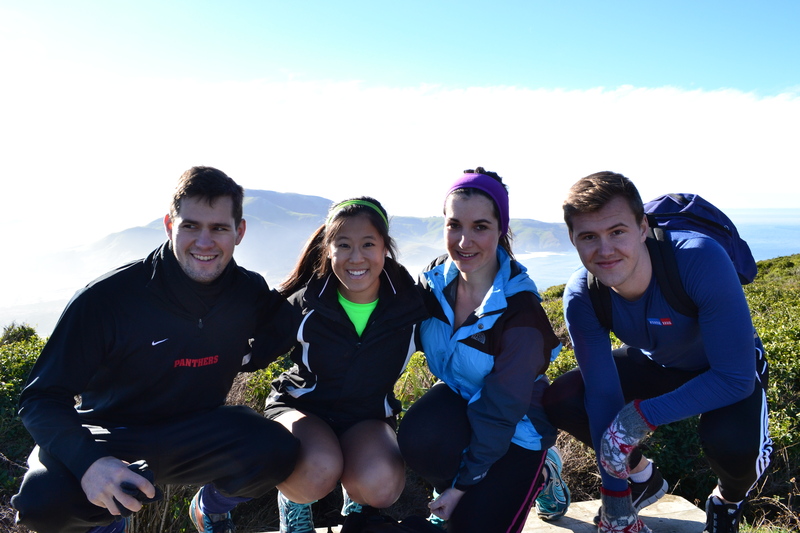 As we hiked through paths, valleys and plains, we were able to see spectacular views of the coast of Dunedin. Life had a different dynamic out there. Everything seemed carefree, yet full of adventure all at the same time. 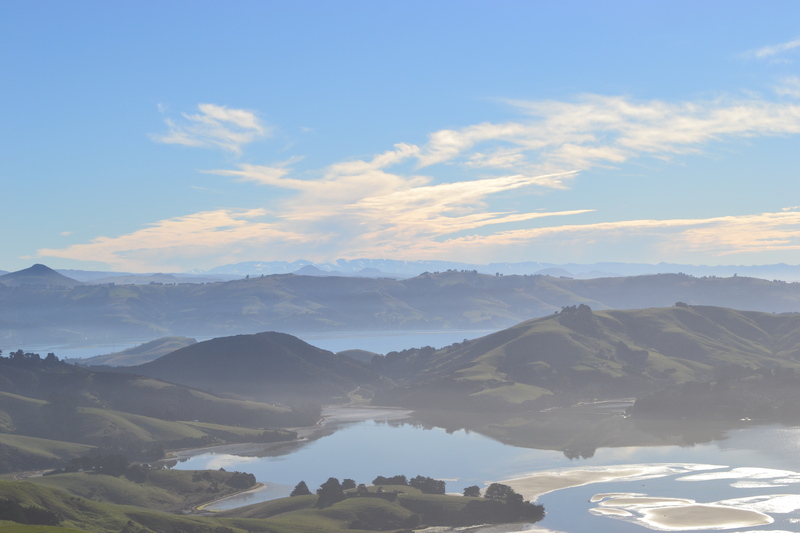 At the Otago Peninsula – I told you it was breathtaking! I felt no fear when walking out to the edge of the cliffs. In fact, there was no feeling that was actually felt at that moment when standing on the edge of a 200 foot fall into the ocean. All I know is that I just wanted to stay there forever, or at least for as long as I could. It’s hard to even think about seeing the remainder of the country, for according to the Kiwis, there are other places and sights that are even more breathtaking than what I saw at that point. After we were through seeing what was at the top, we decided to make our way to the bottom to the beach, Sandfly Bay. We made our descent from where we were parked after returning from the cliffs for about 20 minutes until we finally reached the ocean. As we explored the land, we ran into several seals sunbathing out on the rocks. 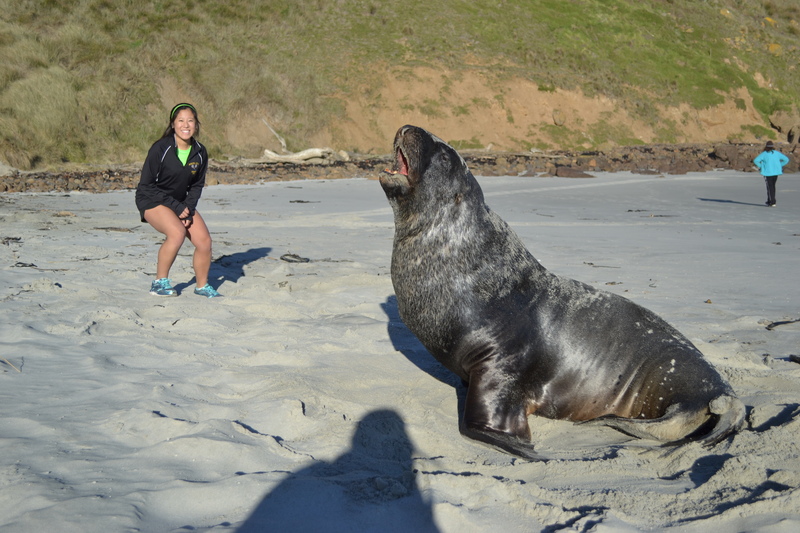 We even encountered a sea lion at one point. The hike back up to the top was a little challenging due to the fact that we had to trek through excessive amounts of soft sand. It took about a total of 30-40 minutes for the group as a whole. Dunedin continues to surprise me more and more, especially when it comes to weather. It could be 55°F and sunny outside, and the next thing we know, the temperature can rapidly drop to 28°F with rain coming down hard within the next hour. Luckily, the weather was ideal when hiking through the peninsula. Despite its unpredictable nature, none of it stops me from enjoying my time here. The quick changing climate has only encouraged me to be prepared for the unexpected. Now that I have finally settled in, I’ve been able to start planning for even more adventures. As of two days ago, I’m officially going to Australia for my mid-semester break with my flatmates. I’m finally making progress on my bucket list, but there is still much more to cover. I have encountered a lot of changes just in the past two weeks. Not only am I seeking out new adventures, but I’ve also created a new kind of life in here in New Zealand. It’s ironic to think that the more new experiences that I expose myself to, the more at home I feel. So “home” is not simply where you live or where you’re from. “Home” is where you feel settled. Where you’re comfortable. Where you’re happy. As a matter of fact, I have found all these elements in my life recently. I haven’t necessarily forgotten or pushed aside my homes back in Massachusetts and Richmond. I’ve just happened to create another one somewhere else. This entry was posted on Friday, July 19th, 2013 at 1:33 pm and is filed under Alyssa in New Zealand, Fall 2013. You can follow any responses to this entry through the RSS 2.0 feed. You can leave a response, or trackback from your own site.